Once again I am baking with my favourite ingredients at the Moda Bake Shop – pre-cuts and bella solids. I have designed a children’s quilt and bed runner with pockets using Sweetwater’s, Lucy’s Crab Shack and Bella Solid American Blue – 9900-174. A fabulous combination that is easy to make to dress up any child’s bedroom and provide a place for them to store their toys and books. Lucy’s Crab Shack is a fun collection with colours suited for both boys and girls. It has such a fresh, summery feel to it. I especially loved the little flags and clothes hanging on the line so much that I drew inspiration from them when designing the quilt top. In this example, I used a flowery trim but if I was making for a boy, I would make a 1/4″ bias binding strip instead. The American Blue solid was the perfect solid to complement the oranges,limes, light blue, navy and pinks in the Sweetwater range. It is not a brassy blue and has a almost grey hue to it. Perfect for both boys and girls. One of my favourite parts of designing a quilt is how I will quilt it. Using Aurifil threads 2805 and 1133, 50wt cottons and a whole lot of fun designs, I filled in the quilt top. 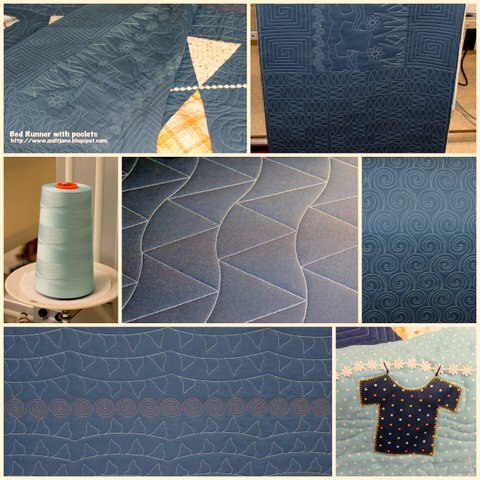 TJ from Stitch Happy Digital Designs provided the perfect Bunting Drape pattern for the quilt top. TJ is a marvel at digital design. I have a thing for swirls and I love placing them on my quilts to provide a sense of movement and to counterbalance square blocks. They have an almost hypnotic effect. I hope you enjoyed today’s Recipe and if you make one please add a photo to the Flickr group. It makes my heart skip a beat when I see my designs made by my lovely quilting peeps. Such a cute and clever design. Your quilting looks fabulous, so well done too! I LOVE the quilting on it! The bunting design is so perfect! Jane, I love it! When you asked for a bunting design I had no idea what the quilt could be. This is adorable!! That is so clever, never seen it before but what a great idea!! its gorgeous! Lovely quilting too! wow such a cute idea a bed runner. That is adorable!!!! Great job! Both the quilt and the runner are gorgeous! What a great idea to include pockets! Wonderfully cute! Especially for when you aren't feeling well enough to get out of bed. You can have your magazine there. Perhaps a sketch book and a box of pencils. I love this idea!!! Jane I love it!!! What a cute idea and the fabric choices are perfect. I love this so much! The quilting is amazing too. What a great idea!! Super cute! Great project! I think our house could use about 5 of these. Everyone likes to read or look at books before bed; how handy would those pockets be!! You have 2 of my favorites combine. First, I have to say what a cute bed runner and lovely quilt. Lucy's crab shack is my favorite fabric line. Your works are really great!!! FABULOUS!!!!!!! I saw this in the shop and recognized it as "you" right away. It is such a great project!!! !